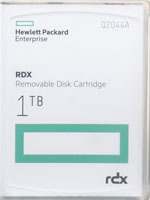 The HP RDX Removable Disk Backup System delivers an easy to use, affordable and rugged data protection solution for workstations and entry level servers in your small business. Backups are simple and pain-free with drag and drop file access. Reduce cost of ownership with long lasting removable disk cartridges and a forward and backward compatible docking station that does not require a costly and disruptive upgrade to accommodate future higher capacity cartridges. The RDX Removable Disk Backup System offers fast disk based performance with the ability to store 500GB (Q2042A), 1TB (Q2044A), 2TB (Q2046A), 3TB (Q2047A) or 4TB (Q2048A) of data on a single removable disk cartridge at speeds of up to 360 GB/hr. Portable, durable and rugged removable disk cartridges simply and securely store your backups off site for complete data protection and peace of mind. 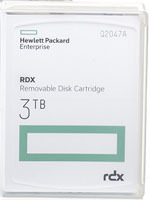 • Choice of 500GB, 1TB, 2TB, 3TB or 4TB capacity removable disk cartridges. • Drag and drop file access makes backup as easy and convenient as the click of a mouse. • Compatible with leading CDP/ISV backup software applications. • Backup data at fast hard drive speeds (up to 360 GB/hr uncompressed data*) and restore critical files in seconds with random disk access. • Disk cartridges designed for long usage life – over 5,000 load/unload insertions. • Portable, durable and shock proof cartridges (can withstand drop of 3 feet/1 meter). • Broad compatibility with a wide range of servers and operating systems, including Windows® 8, Windows Server 2012 and Linux-based Network Attached Storage. 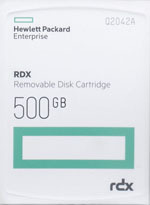 • Cartridges are interchangeable in any HP RDX docking station. 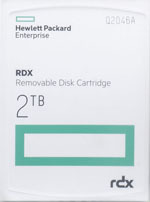 HP RDX 2TB 10-Pack Disk Cartridge w/FREE USB 3.0 External Docking Station - HPE RDX 2TB Bundle Q2046A-10PK This is the HPE RDX 2TB Bundle Promotion with the purchase of 10 HP RDX 2TB Disk Cartridges you get a FREE External USB 3.0 RDX Docking Station. HP RDX+ USB 3.0 External Docking Station Part# C8S07B USB power Capable so it requires no separate power source. 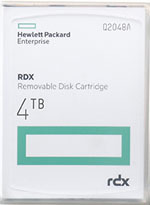 HP RDX+ USB 3.0 Dock available at BackupWorks.com call us today toll free at 866 801 2944 for all your HP RDX removable Disk storage needs.